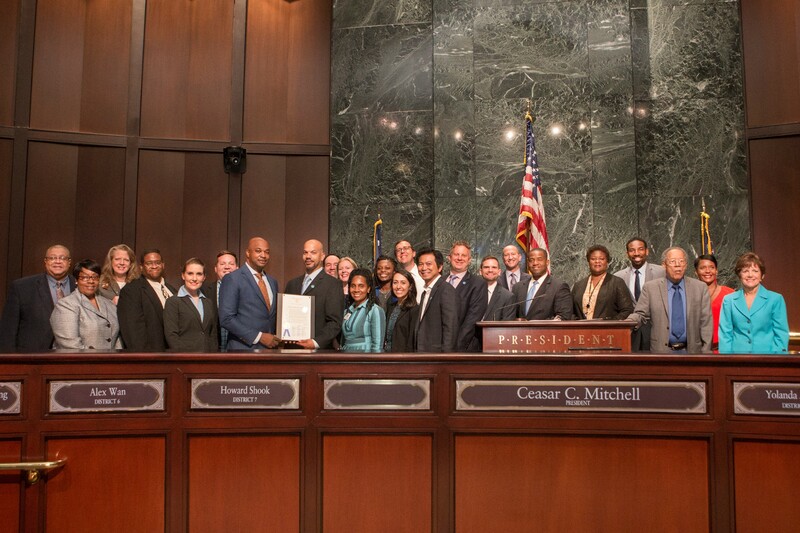 ATLANTA, October 25, 2017 /3BL Media/ – District 2 Councilmember Kwanza Hall presented a proclamation at the Oct. 16 city council meeting in honor of Cox Conserves. Launched in 2007 by Chairman Jim Kennedy, Cox Conserves is Cox Enterprises’ national sustainability program. It focuses on reducing waste, energy consumption and conserving water while encouraging employees and their families to engage in eco-friendly practices. “Cox Enterprises has been a trailblazer in Atlanta’s sustainability efforts and continues to set an example for all businesses that are thinking of going green,” Hall said. In recognition of their achievements, Hall and the Atlanta City Council declared Monday, October 16, 2017 Cox Conserves Day in the City of Atlanta. Several Cox Enterprises-affiliated properties have been recognized locally and nationally for their reduced environmental impact. For example, the WSB-TV property in Midtown exceeded Atlanta’s Better Buildings Challenge six years ahead of its goal. The AJC property houses the nation’s first newspaper printing facility to receive certification from the U.S. Zero Waste Business Council. Buildings on its headquarters campus have achieved LEED Gold status. “Cox Conserves is an important part of our culture and it is involved in everything that we do. We look at everything we do every day and ask ourselves how we can operate more efficiently,” said Clarence Jackson, senior director of operations at The Atlanta Journal-Constitution, who accepted the proclamation on behalf of Cox Enterprises. Also speaking as part of the proclamation presentation were Michael Halicki, Executive Director of Park Pride, and 2011 Cox Conserves Hero Na’Taki Osborne-Jelks of the West Atlanta Watershed Alliance. Since 2007, Cox Enterprises has donated more than $35 million to sustainability and conservation-related organizations in Atlanta, including the Atlanta BeltLine and Atlanta Botanical Garden, Centennial Olympic Park, Chattahoochee Riverkeeper, Food Well Alliance, and the PATH Foundation.